In the wake of recent revelations about the NSA’s extensive surveillance powers over foreigners and American citizens, an ever-fuller picture of mass surveillance is being drawn in the US, the UK, and across the Western world. But what about clandestine surveillance practices in African states? How do they approximate or differ from those we’ve heard so much about in the last few weeks? A recent case from West Africa can help us begin to answer these questions. In March, Benin saw its own wiretapping scandal involving familiar elements: accusations of executive overreach and a telecoms company accused of collaborating with state surveillance. The Cotonou-based newspaper La Nouvelle Tribune reported that “sources close to power” said a wide range of members of the government, as well as the political and economic class, were under ongoing audio surveillance. This alleged surveillance—tapping of mobile phones and recording of private conversations—was also reported in the ‘Lettre du Continent’ feature of the Africa Intelligence site. 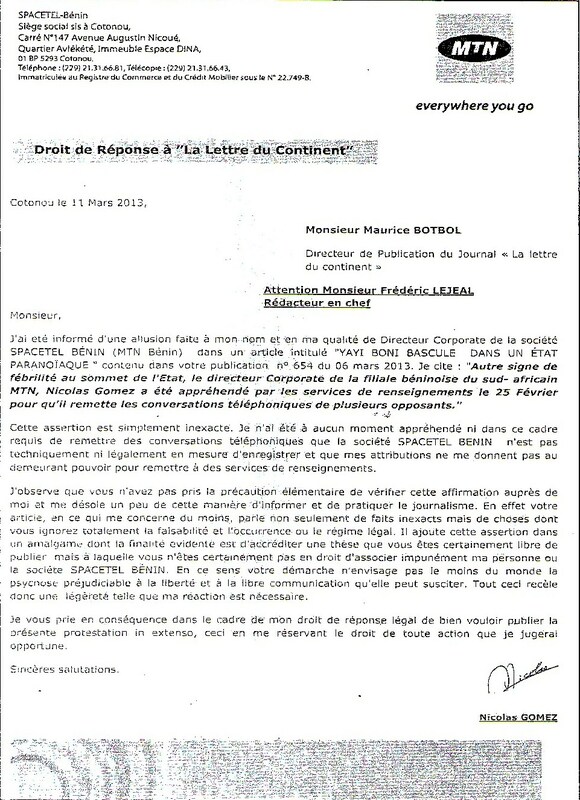 According to the La Nouvelle Tribune article, the technology being used for the wiretapping has been supplied by Spacetel, the local affiliate of South African telecoms giant MTN, at the request of the government of Benin. The report went on to say that President Thomas Boni Yayi’s office, as well as his private home, were the central hubs for the surveillance systems, which allowed the president “to wiretap anyone he likes”. 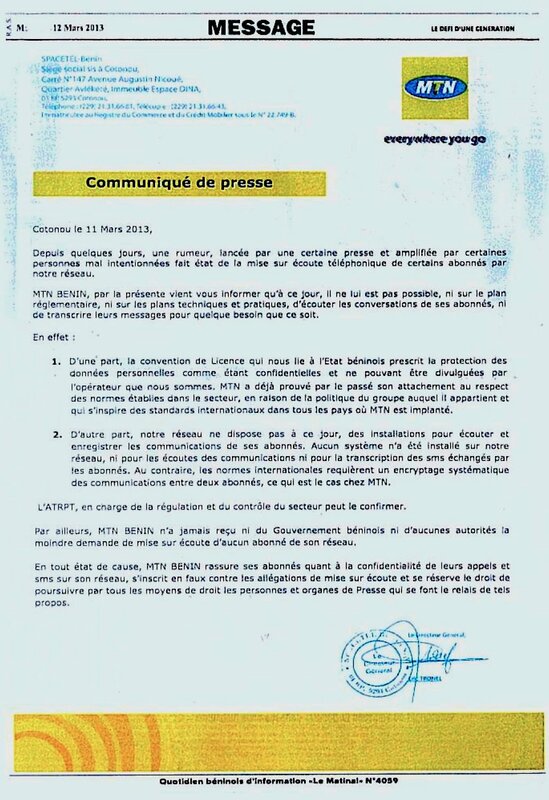 Spacetel, in a press release and letter issued a few days after the report came out, vociferously denied the allegations that it was allowing the government to wiretap its customers, citing Beninese data protection laws, its own inability to monitor calls and SMS, and its “systematic encryption” of all communications on its network. It also denied ever receiving a request from the government to wiretap any customer. Although this introduces an element of doubt, the PRISM revelations in the United States have shown that ‘backdoors’ in communication systems are quite easy to put in place, leading to exploitation. This case has some familiar features to the NSA/Prism stories, whether it is the use of warrantless wiretapping, or President Yayi’s invocation of threats to state security in order to justify clandestine surveillance. However, the Benin case is most notable for what it tells us about the quite different logic through which surveillance happens in Africa. For instance, the collection of subscriber ‘metadata’ does occur, but in a way that helps the government have a clear picture of who is using mobile phones in the first place: since 2010, Benin has, like most other African countries, required compulsory registration of SIM cards. The piece in Africa Intelligence also spoke of a “bunkerization” around President Yayi, who faced an assassination plot in 2012. The accused in this plot, businessmen Patrice Talon and Olivier Boko, are both allegedly under surveillance, which allegedly began under a request directly to an executive of Spacetel, rather than through a court order. If true, this further highlights a combination of technical surveillance with the ever-informal nature of African politics. Finally, this case should push us to think about how technology transfers between countries, which drive the expansion of digital surveillance practices in Africa. South African biometric expertise is used across the continent and such technology from American and European manufacturers is increasingly deployed for airport entry-exit tracking, civil registration solutions, or voter registration. In many cases, personal data protections are difficult to ascertain or enforce, or exacerbate existing ethnic or social divisions. Although surveillance tools may be similar between Global North and South, the legal and social context into which they are deployed is a key determinant of whether they are helpful or pernicious.